We have been visiting Wildwood at least twice a year since 2001 and love it! Out of all of the south jersey shore locations, North Wildwood, Wildwood and Wildwood Crest have the most to offer in regards to activities and fun! Matter of fact, in our opinion, it is the best boardwalk at the Jersey Shore! The boardwalk starts in North Wildwood and ends in Wildwood Crest. The entire length of the boardwalk is 38 city blocks and sprinkled up and down the boardwalk are a ton of gift shops, home decor stores, a few craft stores, jewelry stores, arcades, restaurants, cafes, coffee shops, ice cream shops, miniature golf, amusement piers with rides, water parks for wet 'n wild fun and so much more! 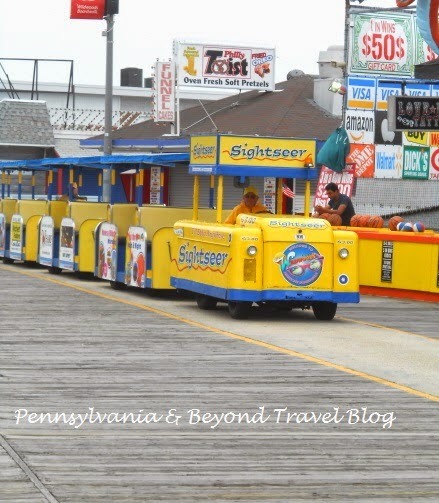 One of the things you will see running up and down the boardwalk is the world famous Sightseer Tram Car. This tram car costs $3.00 per person, per way or $6.00 per round trip. It is great for people who can't do a lot of walking or for people who want to get from one end to the other quickly. 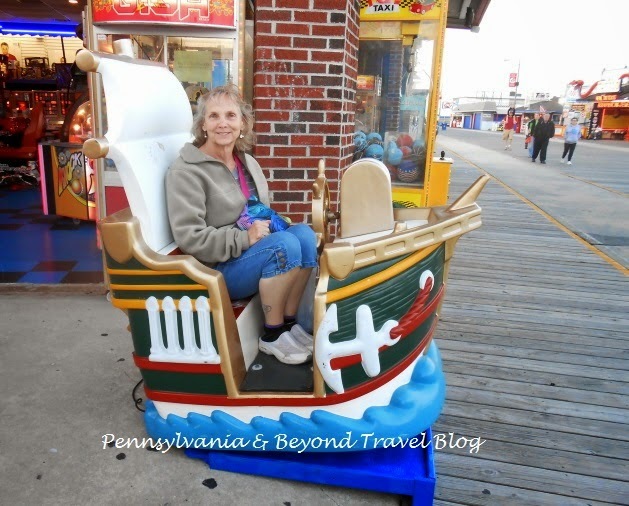 Sometimes we will take the tram car from North Wildwood down to Wildwood Crest and then walk & shop our way back....lot's of fun! The Wildwood Boardwalk has your standard fare of all kinds of yummy things to eat. You can find soft-serve ice cream (our favorite is Kohr's), Polish ice, soft pretzels, cotton candy, saltwater taffy, creamy fudge, hot dogs, hamburgers, a slew of pizza parlors and so much more! There is good eat'in to be had at the Jersey Shore! If the kids are hankering to burn off some energy you can take them to the numerous arcades that are sprinkled up & down the boards! There are three amusement piers owned by Morey's that you can spend a lot of money and time at. Along with the amusement rides...you will find several water parks and a few fun go-kart courses too! 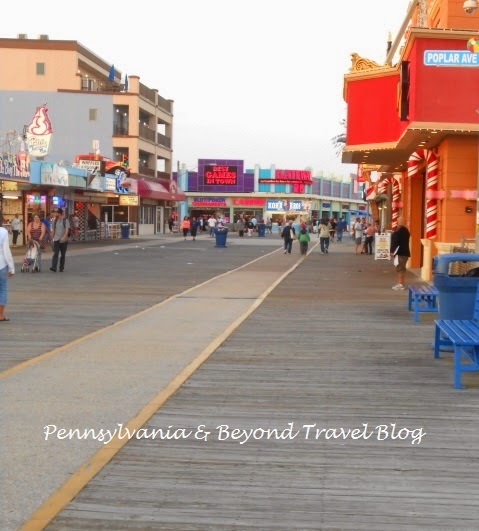 The boardwalk has a lot to offer and makes for a really fun vacation experience! Just be forewarned, during the "in-season" (July, August and early September) it can get pretty packed with visitors and tourists. If you want to avoid the crowds...visit during the months of April, March, June, late September and early October. 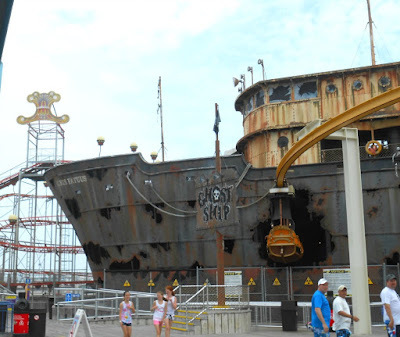 If you are looking for some things to see and do while visiting the Stone Harbor, Wildwood, Diamond Beach and Cape May areas...check out the New Jersey section here on my travel blog. You will find a ton of very detailed blog posts giving you and your family all kinds of ideas! Enjoy your trip! Note: You can click on each photo in this post. It will open in a new window and will automatically enlarge so that you can see all of the details up close.